I am up to chapter 9 of Unsounded. Why have I not read this before? I enjoyed it the most recent time I got caught up but I had started to bump into characters who I realized from the forums here I was supposed to know but they're from like, the answers from an author Q&A or a deviantart or something? I dunno, it was goofy enough I fell off. To be fair, the author has said several times that the comic is supposed to be self-contained and everything that needs to be known will be explained there, so if someone is not properly introduced/explained yet it's because they're supposed to be a mystery for now. All the material of characters that existed before the comic (most of the main ones) is non-canon (or, at most, not relevant to the main story), and the Q&A is only extra lore for the fans that are curious to know. This reminds me of when I started reading Bad Machinery, which I was assured was self-contained, and almost dropped it because of the increasingly frequent call-backs to Scary Go Round (which I in turn tried to read and bounced off of hard), but eventually I got to a point where I was comfortable shrugging those off and not stressing about what I was missing. Was not expecting to say that. The comic never loses a step no matter how long it goes between updates. Woah, what the hell?!? Wonderella updated again?!? What the heck is happening?!? He's trying to sell enough books to pay for future divorce proceedings apparently. He just go married. 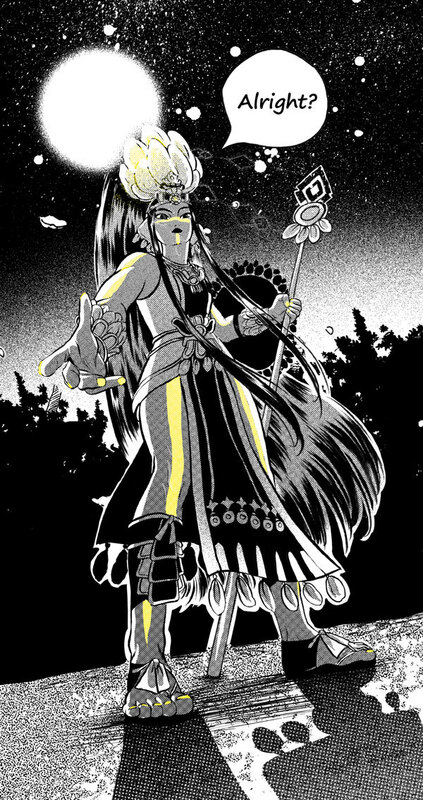 I wanted to bring up Necahual, a webcomic about Aztec Magical Girls! 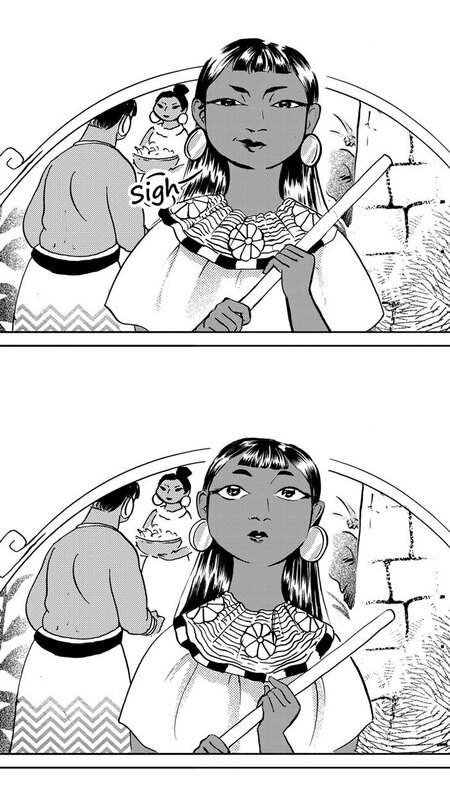 The character designs are fantastic and very accurate for the Aztec Empire era. They are also using historical names, which is also great. I am 100% on board with this but was very bummed to see the illustrator's note about a hand injury and no expected updates until January, oh well. Yeah I follow her on tumblr (she does amazing fanworks) and she hadn't posted much lately other than about her hand injury awhile ago. I'm glad it's on the mend because she really brings life into that 80s/90s shoujo style that makes it still look dreamlike, but also grounded and real. Lore Olympus absolutely nailed it with the latest chapter. I also just realized that Hades is using a man catcher, quite appropriate. I wonder how long it's gonna take the Comic Curmudgeon to realise that "Kevin and Kell" is about anthropomorphic animals rather than furries. Then again it's a guy who's managed to successfully avoid learning anything about Spiderman that isn't in the newspaper strip, so possibly the answer is never. Not all anthropomorphic animals are furries, but also all anthropomorphic animals are furries. Oh good, just enough time to read the massive backlog I've got of it. A good RL friend of mine recently hit 100 pages on her webcomic The Neighbors, which is a domestic drama colliding with an unsettling pod-people type story. It has spare, but gorgeous art. I'm in love with Molly. If you've ever worked in theatre, Q2Q one will hit far too close to home. Man, I don't know. As a sound designer I always felt like a failure when the director just gave in on things. I am enjoying The Neighbors. Latest Girl Genius with, I'm guessing, a cameo by Octo. Harpy Gee posted a little thing. That comic always warms my heart with how pretty and well done it is. Can't wait for it to return soon. And Girl Genius. I really need to get around to re-reading that. Which I think I may have said that before and still hasn't happened. Three Panel Soul is always nice. Since I'm still waiting for Harpy Gee to officially continue, I'm looking for others to fill that niche. Nothing Special fills that niche. Just saw this post and this is awesome. On a related note, Devils Candy is also skating the thin line that may result in Kazu playing a ukulele at a demonic obstacle course/rock concert. Don’t mess this up, guys! This is important to me.